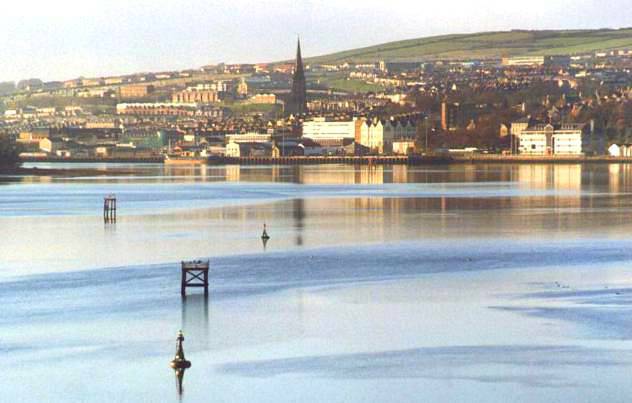 The Maiden City, Londonderry, Derry, Doire, this historic walled city has many names, It got the name "The Maiden City" because it's walls were never breached. King James ll made an unsuccessful attempt to take it in 1689/90. The original city was destroyed by fire and rebuilt in the early 17th. century. It was from her port that many Irish emigrated to escape the famine in the mid 1800's. Photo taken from the new bridge over the river Foyle looking towards the west bank and the city centre. Picture of the old bridge looking towards the city centre taken from the Waterside. Originally it was a wooden bridge that crossed the Foyle here.